Hope College’s popular contribution to Holland’s annual Tulip Time festival will continue with organ recitals thru Saturday. Occurring every half-hour, the 20-minute performances begin at 10 a.m. with the last performance beginning at 1:30 p.m.
Two organs will be used in the recitals: the Chancel Organ, which was built in 1929 by the E.M. Skinner Organ Company of Boston, Massachusetts, and renovated in 2005 and 2006, and the Gallery Organ, built in 1970 by Pels and Van Leeuwen Organ Company of Alkmaar, the Netherlands. 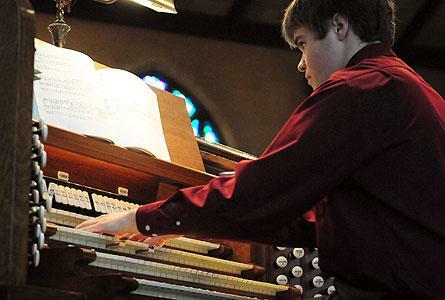 The organists will include Hope College alumni, students and faculty. The alumni are Marie Blauwkamp, a 1962 graduate from Zeeland; Chris Dekker, a 2008 graduate from Hudsonville; Thomas Gouwens, a 1972 graduate from Chicago, Illinois; Patricia Pratt, a 1981 graduate from Wyoming; David Schout, a 2000 graduate from Zeeland; Richard Van Oss, a 1975 graduate from Zeeland; and Norene Walters, a 1982 graduate from Tucson, Arizona. The students are Zachary DeBrune of Greenville, John Deppe of Marshall, Aaron Goodyke of Zeeland and David Heinze of Kentwood. The faculty are Elizabeth Claar West, assistant professor of music; and Huw Lewis, professor of music. Long-time faculty member Susan M. Cherup, who is the Arnold and Esther Sonneveldt Professor of Education at Hope College, has been named recipient of the college’s 15th annual “Vanderbush-Weller Award” for strong, positive impact on students.